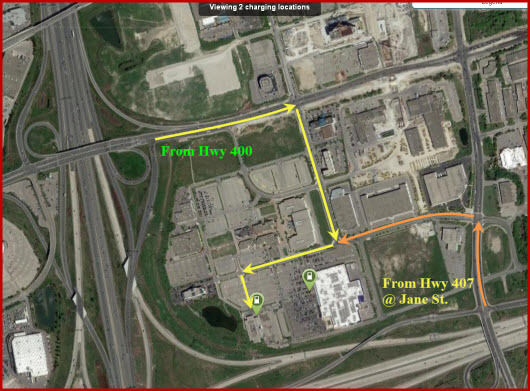 EV Fest 2nd Public EV Charging Station Show - You are invited! Electric Vehicle Charging Stations around Ontario, and Toronto are Growing in Numbers, and not everyone is aware of many of the new locations! This Event is the 3rd (Third) of what we hope to be many, many, such small events, and the Second for the General Public, where we will be creating a smaller event, showcasing the sites where there are more than one Electric Vehicle Charging Station available for Public Access. This one is at (Click Link >) Toronto Region Conservation Authority - Head Office - a New Location only recently listed on PlugShare! Overflow EV Charging at IKEA, Next Door! We will be inviting Electric Vehicle Owners and Operators with EV's and PHEV's to come out and Join us for a Charge, and to Meet other EV Owners, plus inviting Past EV Fest Guests, and the Public, for Events, to Join us and See Just how Easy and Quick it is for Electric Vehicles to be Connected and Disconnected from a Public Charging Station, and how convenient it is to use a Charging Station (IF Electric Vehicle Owners are willing to share these points)! There will be a small Token Fee for these events, usually at the pocket change level, and the events will be shorter in duration than the normal EV Fest Show Hours. Donations for supporting Future Events and EV Fest Growth will also be accepted when Registering. It is OK to come early - but if you come late - the event might be already over! Guest and EV/PHEV Numbers may be limited, as these events will be generally in parking lot spaces where there is vehicle traffic, and there won't be an unlimited Number of Charging Stations. Be Advised - Watch for Vehicular Traffic - Some Won't Be EV's! Not All such Events will be Scheduled with a lot of notice, or with specific permission to have priority access to such Chargers, as they are Public, but as for much of the time most such sites are underutilized, and we will try to invite less EV Owners than the number of Charging Stations on site, so there is room for the general public as well, we feel that for the most part, this would be a great introduction of the realities of EV Charging, showcasing the benefits, and opportunities, as well as any learning opportunities for the uninformed public to develop a respect for Electric Vehicle Charging Spaces, their uses, and diplomacy. Anyone wishing to Volunteer an assist with organizing these events, please contact us. Thanks for coming, and Supporting EV Fest! EV Fest 2016 Guest Tickets Now Available Here! Now that you are here, you can get your Tickets to EV Fest 2016 right below! Choose the Survey option and save $5! No time - Choose the Quick Tickets! Growth of Tesla Superchargers - In Ontario, Nearby, and Worldwide, since Revealing the Tesla Model 3! At the March 31st, 2016 Reveal of the Tesla Model 3, Elon Stated the plans for a massive increase in Tesla Provided Charging Stations, by the end of 2017! The Numbers were basically - to Double the Supercharging Stations (to 7200), and Quadruple the Destination Chargers (to 15,000)! Of course, if you drive a Tesla - you have the possibility to access all Local Public Level 2 Charging Stations, Shared J1772 and Tesla Home Chargers, NEMA 14-50 Campsite Power Plugs (And other types), and also CHAdeMO Public Charging Stations (If you have access to or have the CHAdeMO Adapter)! As to CHAdeMO - they update their numbers periodically on the website - http://www.chademo.com/ and the latest update showed "The number of CHAdeMO DC Quick chargers installed up to today is 11291. -- (Japan 6469 Europe 3028 USA 1686 Others 108) last update 2016.04.20"
Update: The number of CHAdeMO DC Quick chargers installed up to today is 11389. Supercharger information can of course be found at Tesla's Page - https://www.teslamotors.com/supercharger but it can also be tracked on another, quite popular site - http://supercharge.info/ - which might differ in numbers of sites counted, but is a bit more interactive in tracking the build out with presentation of sites that are in permit state, under construction, and completed! To see how many the http://supercharge.info/ counts as having come online, enter permit stage, or start construction, since March 31st, we click on the 'Changes' Link up at the top right of the sites page, and to see how many in each region - and in total - click the 'Charts' Link up at the top right. In all - Each region has been pretty much growing at the same pace of Open Superchargers, with America leading by just 1 more than either Asia Pacific or Europe, and with 19 new sites overall, Tesla owners are seeing steady support in each of their regions, for expanding routes and increasing density in busy routes and areas! The numbers of new sites equal about 1 new site opening in each region, each 10 days as an average! Looking at the Changes - there have been 75 new additions or updates in 59 days, or about 1.27 Supercharger Additions or updates per day since revealing the model 3! Update: + 12 items - see below. Alexandria, LA (20); Augusta, GA (1); Magog, QC (27); Miner, MO (2); and Plattsburgh, NY (18). Hawthorne, NV (8); Grimsby, ON (23). *These are the differences in the dates reported on Supercharger.info from one step to the next (Permit - Construction, or Construction - Open), and may not be precisely accurately reported, but are reasonable indicators of the various amounts of time between steps in the development. This accounts for 12 sites that have changed status from permit to Construction, or from Construction to Open, but 51 others remain that have simply reported a single change from not showing - to permit, or were updated to construction, or updated to open, during this time! There have been 12 Additional Permits issued to allow Supercharger Construction, 21 New sites that began Construction, and 18 other Sites that Opened for access! Permits (12): West Des Moines, IA; Sweetwater, TX; Springfield, MO; Meridian, MS; Lee, MA; Landsberg, Germany; Ewingsdale, Australia; Cuernavaca, Mexico; Cisco, TX; Burgos, Spain; Bowling Green, KY; and Bay City, MI. Construction (21): Vystrkov, Czech Republic; Tonopah, NV; Sulphur Springs, TX; Steg-Hohtenn, Switzerland; Southampton, NY; Saint-Laurent, QC; Peru, IL; Nebbenes, Norway; Murcia, Spain; Lindale, TX; Laurel, MD; Katowice, Poland; Idaho Falls, ID; Harrisburg, PA; Erie, PA; Egg Harbor Township, NJ; Dugopolje, Croatia; Catoosa, OK; Buena Park, CA; Bernau, Germany; Bend, OR. Open (18): Zarechye, Russia; Ya'an, China; West Yellowstone, MT; Wertheim, Germany; Terre Haute, IN; Temecula, CA; Suzhou - Wuzhong, China; Shijiazhuang - Healthy City, China; Sanya - Mingzhu, China; Pearl, MS; Kunshan - Qidi Park, China; Kostomłoty, Poland; Harrisburg, PA; Dongguan - Songshan Lake, China; Chengdu, China; Châteauroux, France; Champaign, IL; Beijing - Youth Road, China. 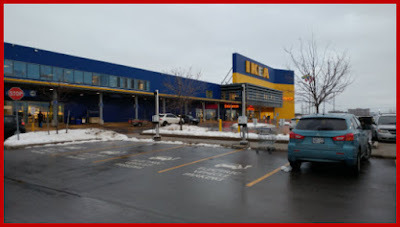 Update: Since I sat down to write this blog post - last Sunday, May 29th, 2016 - with interruptions and an injury at work slowing me down - http://supercharge.info/ has added 12 new Events - updating some from Construction to Open, from Permit to Construction, and New Permits! CHAdeMO has also updated their numbers - added in above! New Permits: Oakdale, MN; Port Huron, MI have been added, Now in Construction Stage is Bowling Green, KY, and Now Open are: Dugopolje, Croatia; Miner, MO; Cuernavaca, Mexico; Tonopah, NV; Southampton, NY; Strasbourg, France; Bristol - M5, UK; Erie, PA; and Shanghai- Grand Gateway, China. Of course - there is a good distance to go towards doubling the number of Superchargers, and - I don't know of a site like Supercharge.info that tracks Destination Chargers - so for that we just have to watch Tesla's page - https://www.teslamotors.com/destination-charging and observe the general action there. is what Supercharge.in was reporting. Write that Date on your Calendar! That was the Day Tesla Allowed Reservations for the Tesla Model 3 to begin at their 221 Stores around the world, for $1,000 Each, with some exchange rates considered!! It was also the date where Tech, Electric Vehicles, overshadowed simple Cars, and became an item of Desire - Bigger than any Vehicle in the History of Electric Vehicles! It began an Avalanche of Interest in Electric Vehicles over all - not just the Model 3, and set up one of the largest pre-order Demands of ANY Product in the Automotive World! - Over 200 Australians have lined up to pre-order Tesla's unseen Model 3! - Tesla store at Mall at University Town Center sees more than 100 to reserve new Model 3! - Long Lines at Tesla Stores for Model 3 Reservations Continues to Spread Worldwide! - Tesla Model 3: in-store reservations - impressive lines of people are spotted around the world! - Over 350 people were queuing around Sweden to pay 10,000 kronor in the reservation charge - to a car they have not even seen yet! Tesla Model 3 will show up in the night Swedish time. - From NYC to Zürich, Tesla addicts have lined up to reserve their Model 3 (TSLA)! - People Waited Days in Line to Reserve a Tesla Model 3! - Tesla Model 3: Impressive Lines Forming At Tesla Stores Around The Globe! - 'Bigger Than the iPhone': Potential Buyers Line Up for Unveiling of New $35K Tesla! - Thousands Line Up to Buy the Tesla Model 3, Sight Unseen: Atlanta, Fremont, Zurich...! Cities Like Montreal, CQ; Calgary, AB; Toronto, ON; and many more, saw lines of people from as few as 60, to as many as 800 at one store! You can't even tell if the line is for the ne iPhone or the Tesla Model 3! Over 200 People at Tesla Montreal waiting for the Model 3! ~175 at least in Austin, TX! Line for the @teslamotors #model3 is off the hoo at #parkmeadows #colorado. So Proud of you Bro! There were 115,000 Reservations even before the Reveal on stage of the first 3 vehicles, by Elon Musk and Tesla Motors Inc! TESLA HAS 115,000 RESERVATIONS FOR NEW MODEL 3! Elon shows the Model 3 and Announces 115,000 Reservations in the first 24 hours! Tesla's Model 3 launch 'Just Phase 1,' Elon Musk says"
it's going to be viewed as a $150,000 car on sale." Ophir Gotlieb, CEO of Capital Market Labs. Affordable Model 3 is Tesla's biggest test yet - Updated Friday, April 1, 2016 6:35AM EDT. From the above - it can be seen that This is not just about another Car, Sedan, or Conveyance, but it is about a storm of change beginning to happen, that is being catalyzed by Tesla - with the Model 3! Green Car Reports: How to reserve a Tesla Model 3 at stores and online (updated). Also - go Direct to Tesla's Model 3 Page. Accelerating Sustainable Transport: Why Does Tesla Exist? "It's really important to accelerate the worlds transition to Sustainable energy and transport" - Elon Musk, at beginning of Model 3 Reveal (Video). "We are experiencing Record High CO2 Levels: 403.5 PPM as of March 2016!" "2.3°F Temperature increase since 1900"
Combustion Cars emit Toxic Gases"
"53,000 Deaths Annually [USA Alone] are Attributable to Transportation Emissions (2013 MIT Study)"
These points of concern lead Tesla to develop the Secret Master Plan! 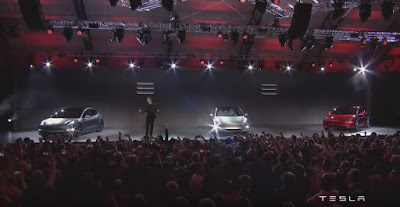 So - as to part 3 of the plan, on the Evening of March 31, 2015, Tesla’s famed CEO, billionaire and inventor Elon Musk, delivered a compelling just under 23-minute unveil of the Tesla Model 3. The Model 3 starting at $35,000 comes standard with an acceleration of 0-60 in 6 seconds. It also has a 215 miles range per charge, and will compete in the small luxury car market along with the BMW Series 3 and the Mercedes S-Class. It has been a long time coming, since August 2, 2006, in fact! But the Unveil was worth the wait! Now - as we go forward - we see more and more people discovering the Tesla Model 3, Putting in a Reservation, and telling Friends, who are going and putting in a Reservation for themselves! The $35,000, 215-mile Model 3 is the final step in Tesla’s ‘Secret Master Plan’ - April 1, 2016. Use that money to build an affordable car. Use that money to build an even more affordable car. The brand has completely failed at that last bit, but tonight, the final piece of the puzzle slid into place with the unveiling of the Model 3 — the EV for the everyman. The most accessible vehicle in Tesla’s catalog, the $35,000 sedan aims to bring affordable electric commuting to the masses with a base range of 215 miles and a targeted safety rating of five stars in every category. A study out of Washington State suggests we could be on the verge of a tipping point when it comes to drivers adopting the technology. The Sustainable Transportation Lab at the University of Washington looked at the halo effect surrounding the sales launch of Tesla’s Model 3. “In the first week alone, Tesla got 325,000 pre-orders. To put that number in perspective, that is equivalent to 25 per cent of all EVs on the road at the end of 2015,” says Don Mackenzie, an assistant professor of civil and environmental engineering at UW. The head of Tesla, Elon Musk, has said he wants to spark the entire electric vehicle industry, and MacKenzie says it is interesting to see that actually starting to play out. Here it is, finally: the Tesla that most buyers might be able to afford. Tesla says the Model 3 will cost $35,000 before any tax incentives; sales begin in late 2017. The rear-drive version will have an estimated range of 215 miles and a 0-60 time of less than 6 seconds. With a bigger battery and all-wheel drive, a range of 300 miles is likely. The interior will have a 15-inch display for vehicle data and controls. Deliveries will start in California and move east as production increases. It is genetically linked to all of its ancestors—both in the styling and in the many pounds of lithium-ion batteries packed into the floor (also, all but the Roadster have front and rear trunks). It owes a heavy debt to the other cars in Tesla’s lineup. Musk did let slip that there will be higher-performance variants coming, and prototypes were shown with big, carbon-fiber-accented wheels and with matte paint jobs. Can a Tesla performance sub-brand be too far off? In its short history, Tesla has developed a passionate fan base. Just two weeks ago, the company sent out an email to its owners asking them to hit reply if they wanted to come to Los Angeles at their own expense to see the reveal of the Model 3. The invite included the chance to get a two-minute chauffeured blast up and down Jack Northrop Drive adjacent to the SpaceX plant. By all accounts, thousands responded. The 650 or so who made the cut for a launch party that, by Tesla standards, was a relatively intimate affair, flew in from as far away as Austria to witness Musk introduce the electric car he says he had in mind when he became involved with Tesla 12 years ago. Tesla was founded 13 years ago and shipped its first car in 2008 – the Roadster. At a base price of $109,000 (£86,950, AU$191,888), it was a long shot away from Elon Musk's vision of an affordable EV. It took four years before the first Model S reached buyers, which now starts at $70,000 (£50,000, AU$97,245) before incentives and is still not very cheap. Now that the Model S and X are out the door, Tesla is ready to unveil its first affordable car – the Model 3. The Model 3 is the first affordable Tesla, starting at $35,000 (£30,000) before any government tax incentives. It should qualify for the $7,500 federal tax credit for US buyers, which brings the price below $30,000 before state incentives, if you're among the early reservations. Depending on the state you live in, more incentives are available to bring the price down even further. Tesla is targeting an electric range of 215 miles with the Model 3 on the base model and plans to offer other configurations like the Model S and X. As an owner of a 2015 Nissan Leaf rated for 84-miles of range, 210 miles would save me the trouble of having to charge in public for 95% of my driving and let me drive from Tacoma, Wash. to Portland Ore. without stopping to charge. Every Tesla Model 3 will have the hardware for Autopilot technology for semi-autonomous driving, including the base $35,000 model. I commend Tesla for this announcement as the Nissan Leaf has zero advanced driver assists and the Chevy Bolt will only have basic collision prevention driver assists. Tesla Vice President says Model 3 reservations are ‘approaching 400,000’, real success will be delivery! After a week, Tesla confirmed in a blog post having received 325,000 Model 3 reservations, another week later, O’Connell now says that “something approaching 400,000 people” have already reserved the vehicle. He then quoted CEO Elon Musk on his plans to increase production following the higher than expected number of reservations. He said that Tesla learned a lot from the Model S and now the Model X production ramp up. They will use this knowledge to get to higher volumes quicker. O’Connell also said that Tesla plans to expand its lineup following the Model 3. He emphasized the Tesla pickup truck that’s been talked about before by CEO Elon Musk. TESLA’S SECRET MASTER PLAN - How Elon Musk is making electric cool. Last week, Tesla’s famed CEO, billionaire and inventor Elon Musk, delivered a compelling just under 23-minute unveil of the Tesla Model 3. Pre-orders, which made the company $115 million dollars in the first 24 hours, are available with a $1,000 deposit. The orders were up to 276,000 by the end of Saturday, as Musk tweeted updates over the weekend. The underlying mission behind Tesla and Solar City, a solar power company funded by Elon Musk, is to combat global warming. The beauty of their design, the brilliance of their engineering – its speed, autopilot features, and supercharging capabilities, coupled with the luxury market entrance made Tesla, synonymous with electric car, highly coveted. - see My Electricfly Blog Post!